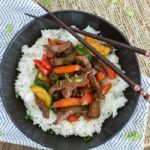 Flavorful and super tender Instant Pot Korean beef couldn’t be easier to make! 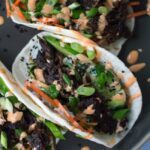 You can serve it in Bibimbap for something a little more traditional or take the fusion route and go with tacos, lettuce wraps, or burritos! 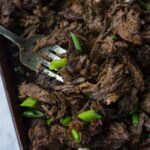 Flavorful shredded beef with crispy edges made really easy in the Instant Pot is a new favorite in our house! This Korean inspired beef is delicious as is with some rice and kimchi, or use it in bibimbap (a mixed rice bowl). Or, you can go the fusion route and make tacos or burritos. 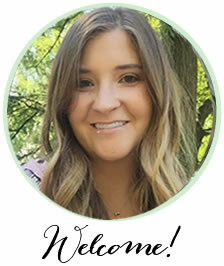 I may have mentioned before that I resisted jumping on the Instant Pot (affiliate link) train for a long time. However, I have to admit I’m really happy to have it! Especially now with a new baby. I love being able to dump a bunch of stuff in, push a button, and walk away. Before I know it dinner is ready! That’s basically how this Instant Pot Korean beef works. 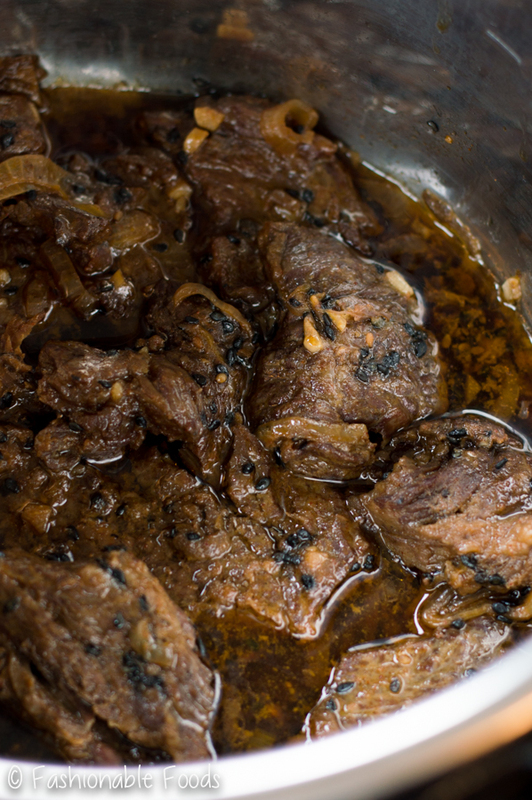 Combine a bunch of ingredients, let the beef marinate, and pop it into the Instant Pot. 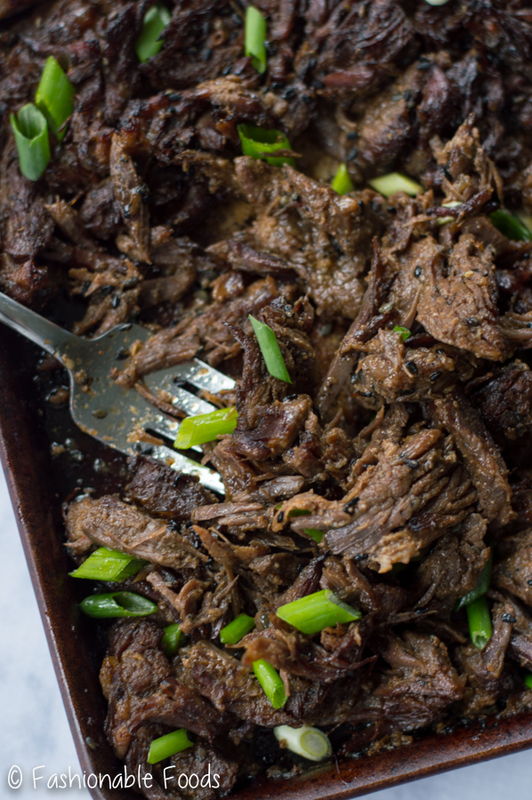 In under an hour you’ve got the most tender, flavorful Korean style beef! 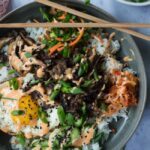 The inspiration for this recipe came from me wanting to make bibimbap. If you’ve never heard of bibimbap, it’s basically just a mixed rice bowl common in Korean cuisine. As per usual when I want to make a recipe from a cuisine I’m not familiar with, I do a ton of research. My research led me to bulgogi, which is simply marinated barbecued beef. I decided to make my own version of bulgogi and then use it to make bibimbap and tacos. Yum! Traditional bulgogi is made with thinly sliced beef (usually a tender cut like a ribeye) and grilled, but since I wanted to make this in the Instant Pot, I used chuck. I sliced it into thick slices and marinated it in a flavorful mix of gochuchang (Korean chili paste), soy sauce, garlic, ginger, sesame oil, sesame seeds, sugar, and a grated Asian pear. The pear helps to tenderize the meat and adds a hint of sweetness. If you can’t find an Asian variety, you can just whatever variety of pear you can find. The gochuchang is a delicious Korean chili paste that is fairly easy to find in most larger grocery stores. If you can’t find it, you can use Sriracha in a pinch. 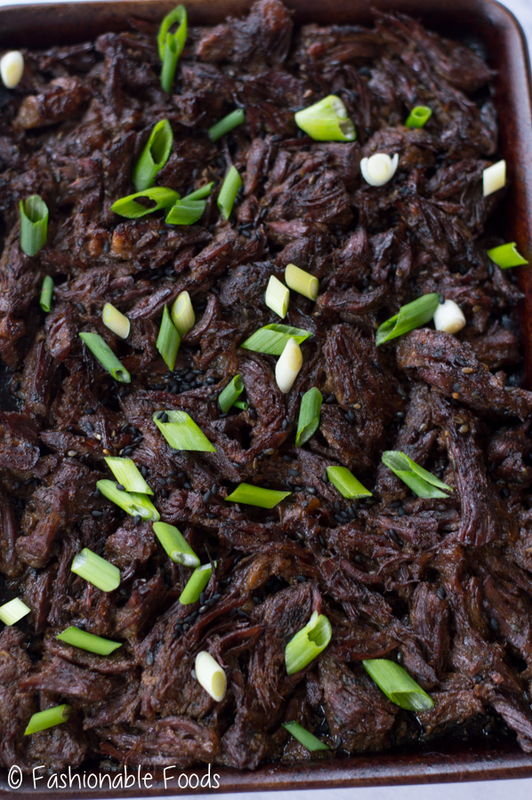 The beef comes out so tender that you’ll be able to shred it easily and if you want to get some crispy edges, pop it under the broiler for a few minutes. This step is optional, but I love crispy pieces so I always do it! A simple way to serve this beef is in the traditional manner with rice and some Korean side dishes like kimchi and other vegetables. I never had kimchi until I made this and let me tell you, it’s one of my new favorite things! It’s a mix of picked fermented vegetables and it’s such a great accompaniment here. ¼ Cup Soy Sauce use gluten-free if needed! In a large bowl whisk together the grated pear, garlic, ginger, soy sauce, gochujang, sugar, sesame oil, sesame seeds, and pepper until well combined. Toss in the onion and beef and coat well. Cover and refrigerate for at least 12 hours, but up to 24 hours. 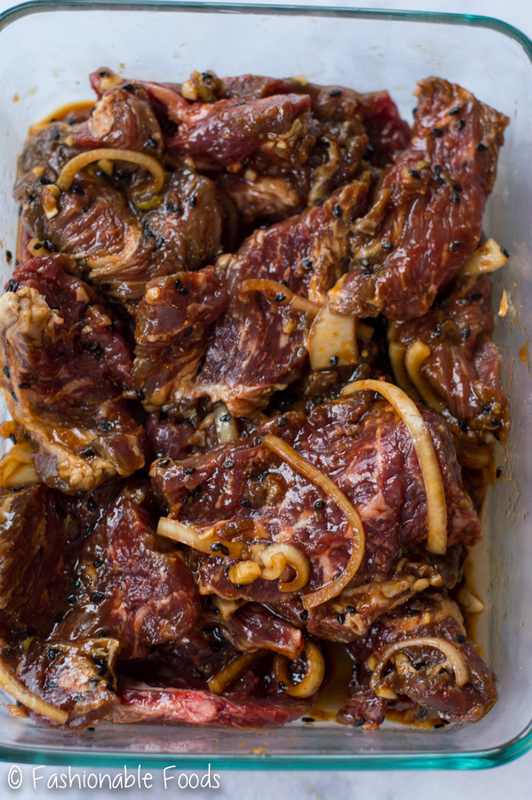 Place the beef along with the marinade into the Instant Pot and set the pressure to high for 20 minutes. Allow for a 15 minute natural release. Serve the beef however you like! *If you can’t find Asian pear simply substitute whatever variety you can find. *This will work with thick slices or medium-large sized cubes. I sliced my chuck roast into 1-inch thick slices.